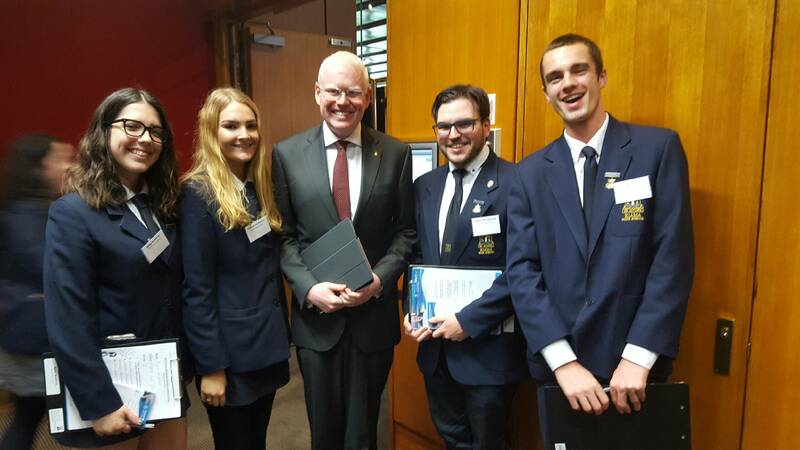 Rhylee Bamford, Sharnie Heffernan, Bryce Humphries and Darcy Lawton were participants in the 7th annual Kiama Electorate Student Leaders Forum, hosted by Gareth Ward MP at New South Wales Parliament House. The student leaders were given a tour of Australia’s oldest Parliament, watched Question Time and during a workshop in the Macquarie Room, were addressed by the Premier of New South Wales Gladys Berejiklian, Education Minister Rob Stokes, Minister for Family and Community Services Pru Goward, Speaker and Member for South Coast Shelley Hancock and the Independent Member for Sydney Alex Greenwich. “We then split into groups with student leaders from other South Coast schools and talked about the big question, ‘If we were Premier for a day, what would we change?’,” says Darcy Lawton, Kiama High’s Vice Captain (right in photo). Gareth’s notes show other policy issues raised included young people and mental health, tertiary education and skills, jobs for young people, local public transport, environmental concerns and the costs associated with learner driver programs. “Of all the events I host in Parliament, this is the one I most enjoy,” the Member for Kiama says. Darcy says he gained a lot from the experience. “We saw what hard work looks like, how to encourage the people around you to also be leaders and how we all have the power to make a change.